This was so epic, I enjoyed it so much, it really feels just like a DKC game, the press start screen song was amazing, I could pause the game and just listen to the music just like I did 17 years ago with the original series, keep it going guys! I'm keen to give the demo a try. I only have a Mac to use for the next few days (bad timing, huh? ), but I'll check it out once I get back to my development PC. I've listed The Kongs Return as a work-in-progress in the DKC Atlas projects section. That whole part of the site has been improved, so take a look. Tonberry2000 wrote: I just want to point out early that the title of the game, in English, should probably be "The Kongs Return." I'm sure you'll come up with a better header anyway, but I thought it couldn't hurt to use this one in the meantime. FINALLY!!!!!!! Thanks so much for the demo!!!!! It's been torture waiting! I'll list what glitches I've found. I'm not going to duplicate what Slym has. 1) I set the buddy barrel down with Dixie and it fell through the floor. 2) Not sure if my machine it just slow, but it seems like black screens before going into a level, or while waiting to go to a bonus are long. 3) When using Dixie and floating, she dies when she hits Klump, rather than bouncing off his helmet like I would think should happen. DK also was unable to jump on Klump. I think you have it set at a weird angle for them to have to jump. If it's just slightly off, they die. It's not just Klump. You have to jump very specifically to kill enemies that are just slightly elevated, such as the Gnawties that are on higher platforms. 4) Sometimes after switching characters, you can't move left or right, you can only roll. Once you jump, though, you can move normally. 5) After you collect the KONG letters and you go into a bonus, you have to re collect them once you come out of the bonus. 6) When using Diddy and trying to team with Dixie, she was caught in a perpetual roll in the air not near Diddy. Being unable to throw Dixie, I jumped on an enemy, and now Diddy is stuck rolling. 8) With Diddy's special ability being able to roll instantly on Kiddy or DK, you can just keep hitting jump and you can't get off of Kiddy and he just keeps floating. When I got hit with Diddy riding DK, DK was stuck in the "riding on a steel keg" animation. 9) Another DK barrel glitch. I was unable to set the barrel down without it breaking. 10) Diddy ran through the bonus exit backwards when I got the coin and he wasn't facing the exit. 11) The speed seems much more normal during the bonus than the actual level, where the characters move very slowly. 12) The jump reaction time seems off during the bonus, at least. 13) When you throw a heavy Kong, they don't kill enemies. 14) The KONG letters don't stay collected after you hit the midpoint and die; you have to go back and re collect them. 15) The whole screen shakes when you're coming back from the bonus level. 16) The second DK barrel automatically breaks when you hit it with Rambi. 17) When I threw Dixie above the trees at the end of the level, she came back through and made me land on the end of the level target, rather than go up on top of the trees. 18) After the blasting barrel part, there's the higher piece of ground with the Gnawty where the actual floor of where he walks is lower than the terrain. 19) When you jump on the end of the level target, there is a lull before the animation and music is played. 2) Shouldn't switching between characters be the 'A' button, rather than select? 3) Why to select a level do you use the 'A' button, rather than start? 4) When you use DK and team up with Diddy, Diddy uses his duck animation from the DKC2 skull cart levels, rather than his teaming up animation. 5) You used Krusha's death noise, rather than Klumps when you kill Klump. 6) After you beat a level for the second time with a different Kong, the face on the map changes to the last Kong to beat the level. 6) The noises in the game, like killing baddies in the bonus level, seem too quiet compared to the music volume. 7) Maybe for the Kiddy-Diddy switch you could use a noise for Kiddy? Wow, what a commendable effort! I was right about it being a workable demo! I'm not going to reiterate the bugs that others have already listed - but you have done a very good job. --The movement isn't as tight as I would expect, or maybe it's just me. --You seriously need to consider a Frames-Per-Second meter. Debugging something like this is difficult if we cannot tell whether the engine is playing at full speed. I have Core 2 Duo, and if it's slow on that, well... I have no idea what will happen on old machines. --100MB for just one world is way too much (I'm assuming the other content is still hidden but included). Please consider trying to reduce the game's size somehow. Perhaps you can get away with UPX Packing your exe (I just tried that, but didn't do much to the exe size, so the MMF2 data must already be compressed very well). --Why are you using a Install Creator Pro installer? That's just extra bloat. Unless you are trying to use the registry, it's not strictly needed. I reccomend 7-Zip instead. EDIT: Going by popular opinion, I have edited slym's download link into the first post so that users visiting the Atlas projects page can download it. Please don't remove that until you have the real demo ready, leo_core. I don't know if it was mentioned before but the kongs flip 2 or 3 times after killing someone instead of just one flip, unless it was done in purpose. I haven't played the demo yet Cosmic, so I may be misunderstanding you... but Kongs have always flipped/tumbled through the air continuously until they land, once they've bounced off baddies after a jump attack. Or are you referring to roll/cartwheel/spin attacks? If so, my apologies. I really did not expect such deep analysis! Thanks!! Guys, I'm going here soon to post an updated version with "more coarse" bugs fixed. Urgent I need to sleep, I'm really very sleepy. Later I'm come back here and answer all questions. I think you guys should make the first post where you can find all the downloads easily. Have them like version 1 and then the first download, then version 2 and the second download, and so on. 1) When using a heavy Kong to team with a light Kong, it's very difficult to throw them upward. When you do, it seems like they have a big arc and it's hard to go directly up. 2) Weird things still happen sometimes when you team up. Right now, I have DK and I teamed up with Dixie and she was caught in a perpetual roll. 4) speed for the Kongs is still very slow, but it seems to pick up and go normal about halfway through the level. 5) beating the level is still glitchy, the animation stops oddly right before you're about to hit the target. 6) It's still really weird to hit an enemy, like Klaptrap or Klump. It should be easier to hit them correctly. 7) After throwing a Kong and walking past them, sometimes you have to walk past twice to let them finish out their hit animation before they follow you again. 8) Switching between Kongs, you have to be on the right terrain, so you have to move around sometimes to switch; you also can't switch on single trees. 9) The Kongs seem to go really far when you throw them straight. 10) After switching Kongs, you have to jump before you can move left or right. 12) When floating down with Dixie at the end of the level, she should hit the target, but she doesn't. 1) I understand that you wanted it to look like sunlight passing through the clouds, but the characters look too contrasty, not really like the sun is passing over them. 2) For the bonus level, when falling, the camera doesn't follow you quickly enough. If you try to jump down to the bottom, it often ends up with you dying because you just barely missed the enemy. 3) I did make turning animations for all the Kongs riding on animal buddies, if you'd like to use them. 4) When Diddy is being carried by a heavy Kong, it's awkward because you've used the duck animation from the skull cart in DKC2. 5) On the map screen, the head of the Kong changes to the Kong that last beat the level. I was wondering if you'd mind if I made some bonus images for you. DK doesn't look like he fits and I think I can make him fit in better. slym wrote: First of all, Awsoooome!! Ahahaha, great list! Great list! Many of these bugs have been fixed in 2nd version, we will study your report carefully, thanks! Cosmicman wrote: This was so epic, I enjoyed it so much, it really feels just like a DKC game, the press start screen song was amazing, I could pause the game and just listen to the music just like I did 17 years ago with the original series, keep it going guys! Thanks! Your contribution (Kiddy's head) helped enrich the project! Thank you for adding our game in the project section and fix the banner, I will go to the person who cares for the blog! Phyreburnz wrote: FINALLY!!!!!!! Thanks so much for the demo!!!!! It's been torture waiting! This list is huge Phyre! We will study and discuss a lot about your list, thank you for beta testing, really lot to fix! Simion32 wrote: Wow, what a commendable effort! I was right about it being a workable demo! There are some stages ready and many other ongoing that same executable. This beta is the "raw" state of project, there are many things not used in this first level and many things are quadrupled, everything in the executable. To make cleaning and full optimization would take a long time, we will do this when we have the demo ready. Simion32 wrote: --The movement isn't as tight as I would expect, or maybe it's just me. Hmmmmmmmmm... we will study about it, ok? thanks! Simion32 wrote: EDIT: Going by popular opinion, I have edited slym's download link into the first post so that users visiting the Atlas projects page can download it. Please don't remove that until you have the real demo ready, leo_core. Cosmicman wrote: I don't know if it was mentioned before but the kongs flip 2 or 3 times after killing someone instead of just one flip, unless it was done in purpose. Qyzbud wrote: I haven't played the demo yet Cosmic, so I may be misunderstanding you... but Kongs have always flipped/tumbled through the air continuously until they land, once they've bounced off baddies after a jump attack. I also did not understand that you referred Cosmic... can you clarify? Phyreburnz wrote: I think you guys should make the first post where you can find all the downloads easily. Have them like version 1 and then the first download, then version 2 and the second download, and so on. Phyreburnz is a machine for making beta test! 'll study your report carefully. Guys, thanks for the feedback! We'll take it all calmly, if you guys see others beyond those errors, please do not forget to report! We rely on the help of you to do a demo with minimal errors possible. That was awesome! Not a lot that I can add to the other bugs, and to be honest I didn't really encounter many. I did notice that the jumping and movement is a bit floaty. They seem to cover too much distance when moving while jumping too. Other than that, it was awesome. I will play some more and let you know of any bugs. Can't wait for the full demo! Somebody mentioned that the camera isn't moving correctly. Well, here's the solution to that problem. This might be a little difficult for you to digest, but this is the algorithm used in DELTA to do the exact-replica DKC1 smooth camera scrolling. The s value mentioned in the code here, is by default set to s = 16. // THIS PART ONLY WORKS USING INTEGER BIT MATH. // CANNOT BE DONE CORRECTLY USING FLOATING POINT NUMBERS. Love the demo. Being a 3d fan I like the world maps and the water animations. And finally all kongs playable. Didn't notice any bugs but I wasn't looking for any. Qyzbud, it is hard to explain but I just played all 3 original games to compare them. On the original games once you jump on top of an enemy on the same ground level all the kongs do a full front flip, sometimes one and a half before landing on the ground, with the exception of Kiddy, for some reason he does more flips, at least two per enemy, now on the demo this seems to be amplified, all kongs do a lot more flips even on the same ground level. Leo, I was amazed the game started on the Kiddy head, the maps look beautiful If you need the Kiddy head with the mouth open, his updated head, or if you need any more models let me know, I will be happy to contribute more with this project. Edit: Is this game going to have a screen stretch option or something similar? I have my computer connected to a 52" lcd hd tv and the non hd lines take up a lot of screen, on the snes9x emulator I can get away with stretching it and it looks great. Hey guys, first of all, thank you very much for playing this! I'm Leo's partner in this project, and i'm very glad to see that you like our work. I'm not going to reply every feedback post, but thrust me, i'm making a big list with all the feebacks that I see. We are going to try to fix this things, but i'm not sure about which will be repaired in the demo. The fact is that we will need to make a big change in the engine to be able to fix some of this problems, so, we are going to release this demo just for you guys give us some feedback and do the beta testing. Keep in mind that we are going to fix ALL the problems and bugs, but not in this demo! Plus, i would like to encourage all of you to tell us every feedback that you have in mind! Not just the glichs and the bugs, but things related to level Desing, enemies movements, kongs movements, scrolling, map, animations, EVERYTHING. We are not a company and we are not going to earn any money with that, so, we would like to make this game with all of you to be sure that it's going to capture the essence od the original DKCs. Thank you all again for all the beta testing and for follow this project. It really makes us very happy! Thank you very much, i get it! I lost a lot of time playing and thinking about how they made the camera's smooth algorithm. by the way, is this used only on DKC1 or in all the three DKCs? can you please make a new list for the version 2 fo the preview? Thank you Phyre, that is a good list! I will appreciate if you make new bonus images for us. We are using the same resolution of the snes. slym and NecroToad, Please stop quoting whole posts. You're clogging up the topic! NecroToad wrote: Thank you very much, i get it! I lost a lot of time playing and thinking about how they made the camera's smooth algorithm. by the way, is this used only on DKC1 or in all the three DKCs? I have not actually researched DKC2's or DKC3 camera system, but rest assured that the algorithm is pretty much going to be the same because Rare was limited by the SNES hardware (this is the reason why it only works with integer math - you need to use bit shifting!!). Please note that the minus signs in the special divide like this: -xMod are not a typo!! It's just part of the bit manipulation. If you have trouble, look up C++ syntax. One other thing I should mention. The code I gave you here is designed to work with a variable s value (smoothing factor) whereas DKC itself only has two different values (default being 16). The smoothing factor must be at least of value 1 or greater, and can not be zero or negative (the code would crash). Using a value of 1 means that the camera is locked to the focus point (Donkey Kong), and more smoothing is applied as you make s bigger. I'm not sure what the other value was, but it's probably 8 since the SNES is being limited to bits here. The other value is triggered when inside a fast camera zone (check DKCRE and look for the red/orange/yellow camera zones for some examples of where this happens). By the way I forgot to mention, I love the cloud shadow effect, it was the first thing I noticed when I started the game. However, it doesn't make sense in this demo level because the sun is setting, and those shadows would only appear if the sun was high in the sky. Perhaps use it in a daytime level instead. 1. You should put a funny intro like in 3 others games. 2.You should put a preview after X time at the title screen like in others games do. This doesn't mean you can't mix it up by throwing in other themed levels. 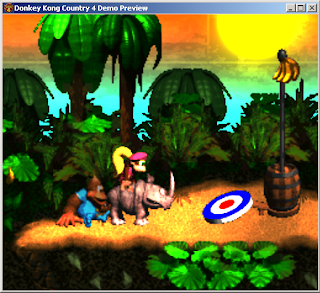 For example, DKC2 used Hornet, Ice, and Bramble themed levels with no worlds that used this overall theme. It seems from your map so far though that there's no overall them for the first world. You have Scarlet Crystal Crossing and the frozen ship stage in the same world, for instance. Then world two could be mountain themed or something and the peak could have an ice level. I'm just trying to think of something what will keep each world "cohesive." Let me know what you think. Basically write the level gimmicks into word lists and then add 1, 1, 1 something to the Sentence Pattern part below and you would get the levels. You listed Caves twice. Didn't you mean Factory? At least that's how I would generalise the worlds, if I were so inclined. Sorry for the long wait, but I finally finished the bonus images. Let me know what you think. I did my best to make DK look like he belonged. Everything is in PNG form, so you can still mess with colours, because I'm pretty sure that all the layers are all there. The bottom two look pretty good, but the top two aren't quite there yet. They look like a stretched sprite and a sprite that used to be 8-bit. Is there any other art you can adapt to it? I was very limited on what I could use for DK. I wanted to use the series renders from the first DKC. The others look different (like in 64 and jungle beat and such) and wouldn't match the two that are good looking. I agree with Tonberry the last 2 are the best. The second image it looks like DK is swimming. I found much better images. I went to the DKU and found better quality images and ones that worked much better! Nice, but in the first one DK doesn't seem to have pupils. So I decided to give my helping hand and now it looks better. I didn't even notice that he barely had pupils! Thanks! We are working on all those reported bugs and suggestions. Yesterday I finally completes the "roller coaster" engine and sent to the Necro Toad finish the job. Phyre, these sprites are great! Some are better than we did, thanks for the input! Thanks for the comments everyone, we are working hard on the project. Excellent job on those latest bonus screens, Phyre (and EK)! I agreed with the previous comments, so it's great that you managed such a significant improvement. Before too long I hope to have a proper gallery set up here at the Atlas (we've been planning it for years...), which ought to make it easy to find the renders you're looking for without having to scour the 'net. EvangeliKong also made a bonus screen? Where is it? The bonus screen he posted is identical to that "Bash the baddies" posted by Phyre. Or am I mistaken? He just edited Phyre's so that DK has pupils. Simion32 wrote: He just edited Phyre's so that DK has pupils. Alright so, yes, your bonus screens look amazing and natural. You've also fixed all the problems that I saw in them, so once again, I have nothing else to tell you but, "Wonderful Ability!" We're not posting anything because we are working at full steam in the demo for the 15th. Take this opportunity to confirm that we have a Roller Coaster level for demo! While the demo is not available yet, I have a challenge for you... someone do this? Why not giving Kongs unlockable skins in future releases? You know, they can be palette swaps or entire attires. Diddy would have DK Jr, Yellow Diddy etc. FINALLY THE DAY HAS COME!!!! 1- Our support to Joystick is not the best, but we intend to update this through some patches. If the game is not recognizing you control or the game becomes very slow, try to run the game with the JOYSTICK DISCONNECT FROM THE COMPUTER! 2- If you are using a joysitck, you will have to configure it in a diferente executable called "Joystick Settings.exe". It's inside the game's folder. 3- Although we are calling it a demo, actually it would be a Beta. The game is still full of bugs, so please have patience and try to describe in detail the problem you have encountered. 4- The first level of the game (which was released a few weeks ago) will be temporarily without shaders. This is due to a restriction in the way MMF2 works with shaders. We are trying to fix this. That's all folks, thanks everyone who accompanied us throughout this time and have been patient with all the unforeseen. You guys gave us the strength to continue with all this work that seems to have no end. Thanks also to Nintendo and Rare for having created the original games. Remember that these companies need to sell so they can continue doing high- quality games. I would like thank Leo, Fernando and Marvin too! It has been an amazing experience working with you guys! Only you understand how it has been suffocating, the sleepless nights, the last minute bugs ... Which reminds me to thanks the existence of coffee and pizzas in the world, without you I'd be asleep! Well, time to play! The link is in the end of the post! Hugs to all and thanks to everyone who helped directly and indirectly with this demo. I am going here soon, I'll be back tomorrow. "The resource you are trying to access belongs to an account that has not yet been validated"